It’s a deep oxblood red perfect for sporting on New Year’s Eve! The shade is really pretty, dark, intense and gives that wintery feeling so would look really classy with any outfit specially if you are wearing a black or a burgundy dress. Bridal sensation is a bright red polish. It’s a perfect red for Indian weddings and so for the New Year’s Eve if you are looking for a bright red to match with your outfit. Royal red is a deep red burgundy but not that intense as bordeaux. It’s a red that fits between bordeaux (a lil less red than bordeaux) and a lil more red than bridal sensation. Red with glitters- perfect combo for the New Year’s Eve! If you are both into glitters and red then the right shade for you is Red Carpet from the glitter mania range of Maybelline. And for the Gold I’ve selected 3 different nail polish with different finish and formula. First is the Maybelline Colorshow Bold Gold- a bold metallic gold, gives such a festive feeling. Bold Gold would look perfect when paired with a black outfit, golden or a silver outfit. Streetwear Color Rich All You Need– a bit different from the Bold Gold, this nail shade has a glossy finish with some shimmers, so if you are looking for a glossy finish gold with tiny bit of shimmers in it then you’ll love this shade. Maybelline Glitter Mania All that Glitters– not the metallic gold like the Bold Gold but is sure a beautiful gold with glitters. Can be paired with any colored outfit for that classy New Year’s look. Though red and gold are the colors in my mind for this New Year but I’m also adding glittery black and a silver shade in this list as I also couldn’t resist from sharing these 3 shades with you all. The one awesome shade you would love sporting on New Year’s Eve celebration is L’oreal Color Riche Le Vernis Glitter Flaming Sunset which is a classy black with big chunky gold glitter particles, such a perfect shade for the holiday and party season. The other glittery black shade is from Maybelline Glitter Mania range- Starry Nights. This glittery black is a black with silver glitter particles, the glitters are not that big as the L’oreal Flaming Sunset polish but it’s a gorgeous glittery black! And the last shade for the New Year’s Eve is Silver Sensation from Streetwear– a lovely glossy finish silver shade perfect for pairing up with your silver shimmery outfit! My New Year Mani would be L’oreal Color Riche Flaming Sunset as I’m in love with this shade and I know I can rock it with any outfit as I haven’t yet decided my outfit for the New Year’s Eve celebration! Love the big chunky gold glitters in this shade, gives such a celebration feel. 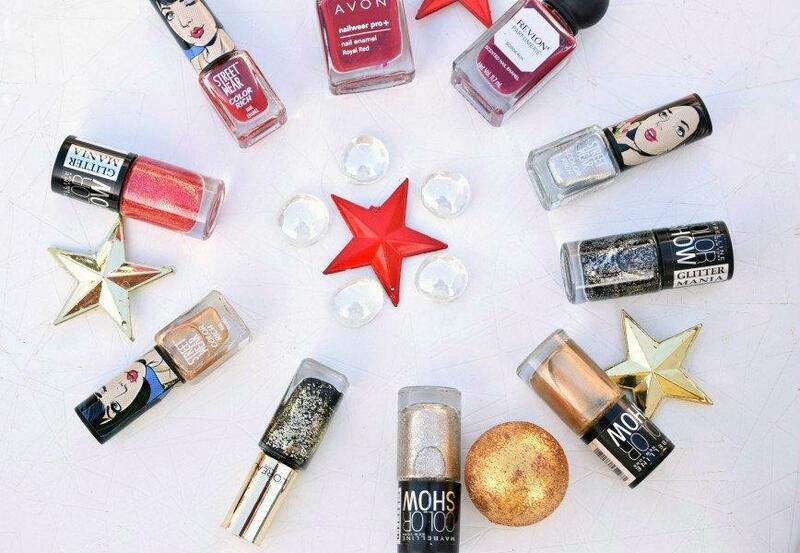 What mani are you sporting on the New Year’s Eve Girls? Nice collection dear, but i was waiting for the swatches. I loved revlon bordeaux!! Such a stunning winter shade! What fun colors! 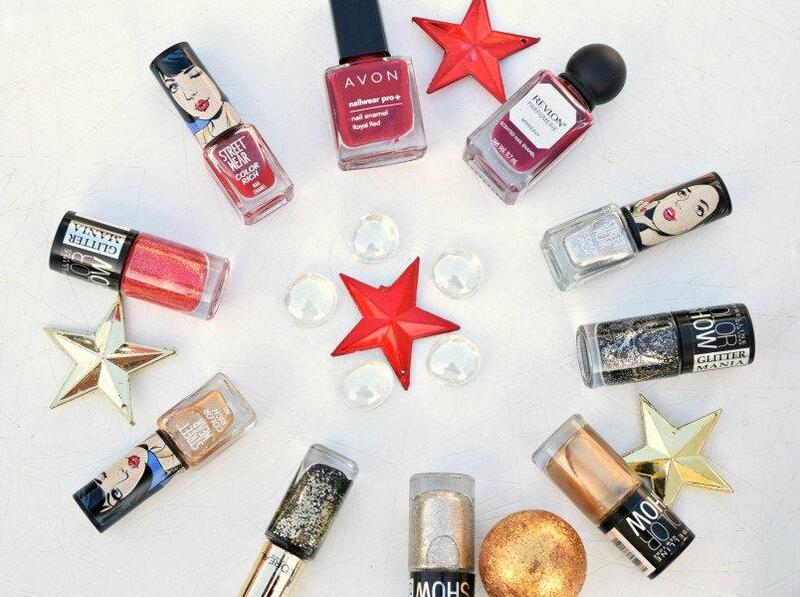 They are the perfect shades for a little holiday fun. I really like the gold colors. Very pretty. I am drooling over ur np collection <3 I really need to check street wear! What a coincidence – all the nail paints you have picked are my favorite and I currently own them :) Great List!